Earth-like planets should be a fairly common feature ofother solar systems in our galaxy, a new study of stellar senior citizenssuggests. More than 90 percent of stars in the Milky Way, includingour own sun, endtheir lives as a white dwarfs. Traditionally, these dense stellar remainshaven't been the first place that astronomers look for signs of planetsoutside our own solar system. Instead, exoplanet searches have focused onstars like our own sun. But tantalizing new results suggest that these elderly starsmight also be a rich source of information on the potential for other planetarysystems out there in the galaxy. White dwarfs should essentially be composed of pure hydrogenand helium atmospheres. Any elements heavier than helium ("metals" inastronomical parlance) present in a white dwarf atmosphere have to bepollutants from some external source. For decades, astronomers attributed this metallic pollutionto the interstellar medium, the thin gas that permeates the space betweenstars. The idea was that white dwarfs were old stars that had been on severalorbits around the Milky Way and had picked up bits of the interstellar mediumas they went around, explained Jay Farihi of the University of Leicester whostudied the white dwarf contamination. "But it turns out that [this explanation] doesn'treally fit the data," Fahiri told SPACE.com. Farihi has looked at white dwarfs with NASA's infraredSpitzer Space Telescope for five years, and thoseobservations showed that the white dwarfs "have dust right on top ofthem," Farihi said. "It's almost certainly raining down on theiratmospheres." Farihi and his colleagues looked at the positions of thesewhite dwarfs within the Milky Way and estimated whether the impurities they sawin the stars' atmospheres could be explained by sweeping up the interstellarmedium. "And the answer is a resounding 'No, it doesn't make sense,'"Farihi said. To get a better look at the pollution in the white dwarfatmospheres, Farihi and his colleagues used data from the Sloan Digital SkySurvey, which has taken the spectrum, or light signature, of 1 million cosmicobjects. They found that the types of metals seen in the stellaratmospheres, such as silicon, magnesium and iron, suggest a rocky origin. 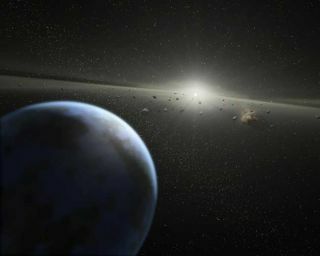 Theexact source of the rocky debris isn't known, but Farihi says there are twopossibilities: the debris could come from an asteroid belt similar to our own,which essential represents a planet that didn?t form, or the pieces of ashattered planet. The new work, presented this week at the Royal AstronomicalSociety meeting in Glasgow, Scotland, indicates that at least 3 percent andpossibly as much as 20 percent of all white dwarfs are contaminated by rockymaterial. This in turn suggests that a similar proportion of stars like thesun, as well as some a little more massive, such as Vega, that eventuallybecome white dwarfs host planetary systems. Another recentestimate suggested that about 15 percent of the stars in the Milky Wayhosted systems like our own. Interestingly, there are also indications that some of therocky material polluting the white dwarfs contained water. The white dwarfs studied had helium atmospheres, but showedtrace amounts of hydrogen, one of the two elements that make up water. If thehydrogen and the metals came from different sources, the stars that containedthem both should be rare, Farihi explained. But they were actually fairlycommon, suggesting that the hydrogen and metals have the same source. "The rocks that delivered the metals probably deliveredthe hydrogen," Farihi said. The hydrogen suggests that the minerals thatcontained the metals also contained water, an essential chemical for life as weknow it. Finding an oxygen signature in the atmospheres of thesewhite dwarfs would help bolster that interpretation, but Farihi says the teamwould need to use the Hubble telescope to find that signature. They haverequest time on the space telescope and are waiting to hear back to see iftheir proposal is granted telescope time.